The King's Speech is a rather rudimentary film enlivened by some excellent acting. Had it not won Oscars for Best Picture and Best Director before I viewed it, I'd probably have enjoyed it considerably more than I did. The wide-angle lensing used throughout the film seemed excessive to me, good for a narrative more grotesque than one about a prince's speech impediment: it feels like an unsuccessful attempt by a man used to directing for television, as Tom Hooper is, to make cinema out of a piece of theatre. There's a noticeable axis jump in the long scene where Colin Firth and Geoffrey Rush first meet, which is really surprising considering how much TV work Hooper has done. The music was horrible throughout, cutting unnecessarily into the final address, delivered by George VI as war clouds gather over Europe. The highlight of last month's disastrous Oscar ceremony was the cutting of glimpses from the ten movies nominated for Best Picture to the sound of Firth's final speech. It worked much better than the mute tableaux presented near the end of The King's Speech. Another downside to this enjoyable minor film was Timothy Spall's scowling Winston Churchill: surely the worst Churchill in movie history. 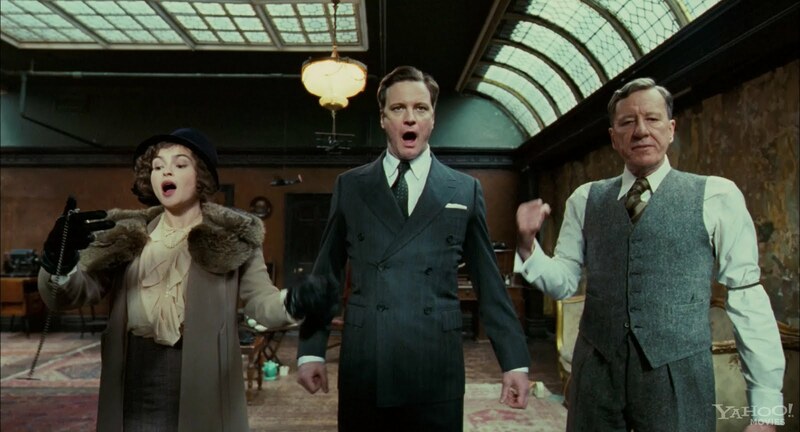 The film was hit with an R rating in the United States, thanks to the profanities voiced by Firth after Rush encourages him to overcome his inhibitions. Harvey Weinstein is now considering a PG rated version of the movie with the strong language removed. For some reason, the Indian censors have passed the film with a certificate for Universal exhibition, without a single sound cut. Funny that a series of fucks enunciated in a plummy Brit accent is fine for kids to hear, but if an Indian character says madarchod, our censors find it too provocative even for adults. When a nation went gaga over Firth's Darcy I did too. And knew his filmography by heart and then watched Fever Pitch and Bridget Jones etc subsequently with disappointment. And realized that Darcy was the pull, not Firth. Then he semi resurrected himself via Tom Ford last year and one was happy for an extremely likeable human being that Firth is. But best actor for The King's Speech? Speechless. Bardem was my choice. The best thing about The King's Speech is Guy Pearce. I thought it dragged on a bit. And yes our censors are funny.